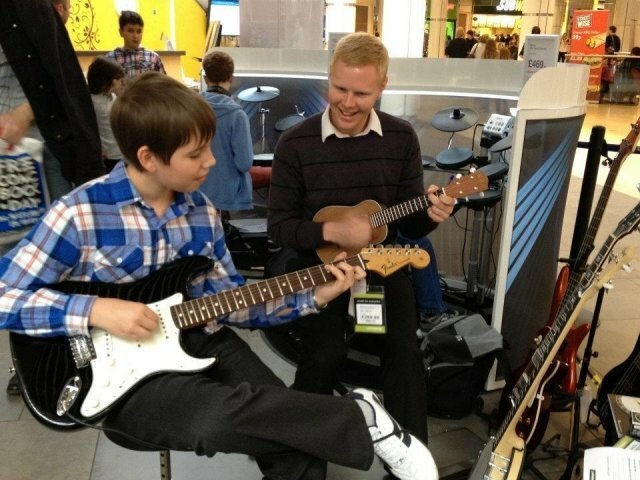 I am a 28 year old guitar teacher, originally from Newcastle-Upon-Tyne who has recently relocated to London. For the last 10 years I have played in a whole host of bands doing all sorts of styles and playing many venues. I have experience in recording, Live sound and Songwriting. Currently play in a band called 'Athletes in Paris' who have done numerous UK tours. I began teaching Guitar and Bass in 2008, mainly doing one to one private lessons and built up a base of pupils of all ages. Also that year I started teaching in primary schools to groups of children from ages of 6 upwards. I have also been involved with teaching events arranged by the musicians union i.e 'learn to play day'. I was also involved with the school of rock and pop which was a scheme getting young teenagers into bands, and every term they would do a performance at a venue like the O2 academy. I currently do work for Waltham Forest and Camden Music Services. 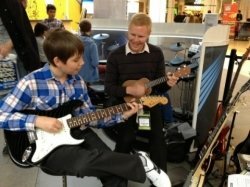 Generally my approach is casual but firm I guess I use a number of techniques which I have learnt from great teachers to actually help you learn and improve as a guitarist in a way that will be much more of practical use. If you want to go through the more graded side of things I have experience in both Rockschool and RGT syllabuses. I believe the best teacher is yourself and what you do between lessons is most important, I will teach you the best method to get there and avoid the many mistakes which, most in guitarists (including myself) have made along the way. Hopefully you will get as much enjoyment from the guitar as I have, at the end of the day it's meant to be tough but enjoyable. JoakimFrom Tom (5/5): Only had a few lessons so far but Joakim seems an excellent tutor. Listens to requests and tries to make learning tuned specifically for me, I would imagine his lessons differ a lot depending on the interests of each of his students. Provides useful material for me to concentrate on at home and very nice and helpful in telling me how to get to his house when I got lost!